KNOXVILLE, Tenn. – Gary Royal has joined Mortgage Investors Group to oversee the mortgage lender’s growth in new markets across the Southeast region, company officials announced. 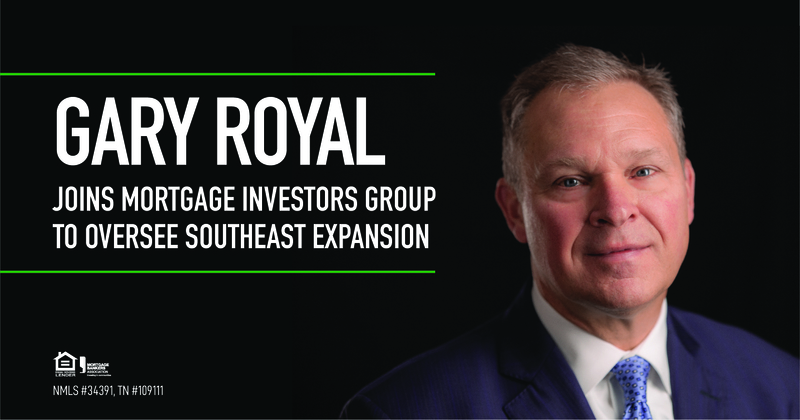 As MIG’s new VP, Southeast regional production manager, Royal will lead the Knoxville-based company’s efforts to expand its retail presence outside of Tennessee, where it has been the top residential mortgage lender for more than a decade. MIG Executive Vice President of Production Steve Smith said Royal will be based in Atlanta, where, for the past three years, he has served as national retail sales manager for one of the country’s largest lenders. The expansion includes opening branches in select markets across the Southeast, including Alabama, Florida, Georgia, North Carolina and South Carolina, he said. Royal joined MIG Feb. 18, but his career in mortgage lending spans more than 30 years with experience in retail lending, correspondent lending and senior-level mortgage management. He previously worked with MIG in his role as a correspondent lender. Royal, who holds a finance degree from the University of North Florida, said he looks forward to introducing like-minded mortgage professionals to a culture they may not have experienced before. “We are going to focus on finding the right people – people that really fit the culture and will thrive with the unparalleled support they will experience at MIG,” he said. MIG is the #1 residential mortgage lender in the state of Tennessee. Since opening its doors in 1989, it has served more than 125,000 clients in excess of $20 billion. The firm has nearly 400 employees in 25 branch locations from Memphis to the Tri-Cities, and has also been the THDA top lender for 16 successive years.